Tharpo the Clown has performed at thousands of events since 1984. Crafting a spectacular, one-of-a-kind show that will amaze and amuse your audience, Tharpo uses skills such as: jokes, poetry, magic, juggling, comedy, ballons, games, face painting, balancing, mime, stilt walking and many more! We want to make your Next Library or School Event your Best Event by providing you top-of-the-line entertainment! 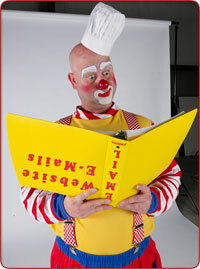 Tharpo the Clown - our most "all around" entertainer - can do most anything! He is one of the top-ranked entertainers in Texas, having won the Kathleen Turner Scholarship in Performance at Southwest Missouri State. With thousands of events under his belt since 1984, his shows are perfect for any event. He does a high-energy comedy improv show appropriate for participants aged 3-98. Uniquely skilled in Crowd Control, Meet and Greet, or being a Barker, Tharpo can adapt to any crowd's needs - whether entertaining or crowd movement. Tharpo can also be very interactive - teaching your participants to Juggle, Balance Objects, and Twist basic Balloon Animals. Or, he can organize and run some fun, high-energy Games like Limbo, Walking Basketball Hoop, Jump Rope, Hula Hoop and Parachute Games or...bring out the Bubbles for Fun and Entertainment! He can quote poetry (cool stuff he has written), tell puns for hours (we mean it! ), and literally entertain your participants from morning until sundown! Tharpo can dress in a variety of costumes to enhance your event! How about a cowboy on stilts, or a gorilla in a tutu? Uncle Sam is always a hit, as is the witty Renaissance man!